1. Preheat oven to 200°C, gas mark 6. Place the chicken in a large bowl and mix in the jerk sauce. Place the chicken on a large baking tray, reserving the marinade and roast for 25-30 minutes or until cooked throughout with no pink meat. 2. Meanwhile, blanch the sweetcorn in boiling water for 5 minutes, drain and coat in the reserved marinade. 3. Bring the coconut milk and 300ml water to the boil in a large saucepan and add the rice, cover and cook gently for 5 minutes, stirring occasionally. Add the beans and cook for a further 5-7 minutes until the rice is tender and the liquid has been absorbed. Allow to cool, then stir in the salad onions and coriander. Whisk together the lime zest and juice and mayonnaise, then stir into the salad and season to taste. 4. 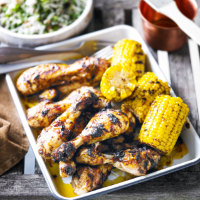 Place the chicken and sweetcorn on the barbecue for 5 minutes, turning occasionally until slightly charred, then serve with the salad.